New polling on behalf of Barley Communications and World Obesity Day shows people with obesity face discrimination in the UK, South Africa and Brazil. 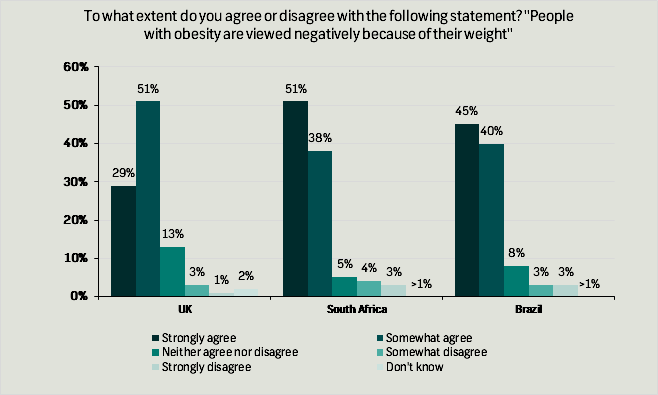 81% of respondents in the UK, 89% in South Africa and 86% in Brazil agree that “people with obesity are viewed negatively because of their weight”. In all but Brazil being overweight was seen to be the most likely reason, out of the options available, for someone to be discriminated against. 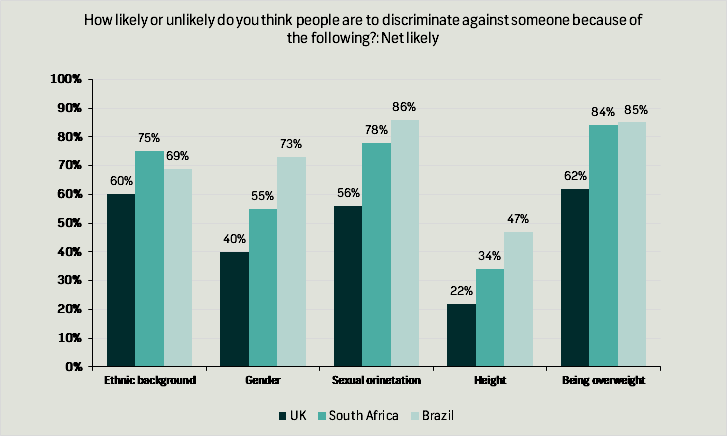 In the UK 62% of respondents believed people were likely to discriminate against someone because they are overweight, in South Africa this was 84% and 85% in Brazil. 60% of respondents in the UK believed that people were likely to discriminate against someone for their ethnic background and 56% believed the same about someone for their sexual orientation. This was 75% and 78% in South Africa and 69% and 86% in Brazil respectively. Significant proportions of respondents with obesity had felt judged because of their weight in certain situations, for example in clothes shops, healthcare settings and social situations. In the UK this was 46%, 45% and 45% of respondents for each of the three situations respectively. In both Brazil and South Africa a majority of respondents had felt judged in each of the situations. The discrimination highlighted above can be found in a hypothetical situation offered to respondents. When asked to imagine they were interviewing two equally qualified candidates for a job, one of whom was overweight and one who was not, significant percentages said they were less likely to appoint the overweight candidate (25% in the UK, 30% in South Africa and 22% in Brazil). 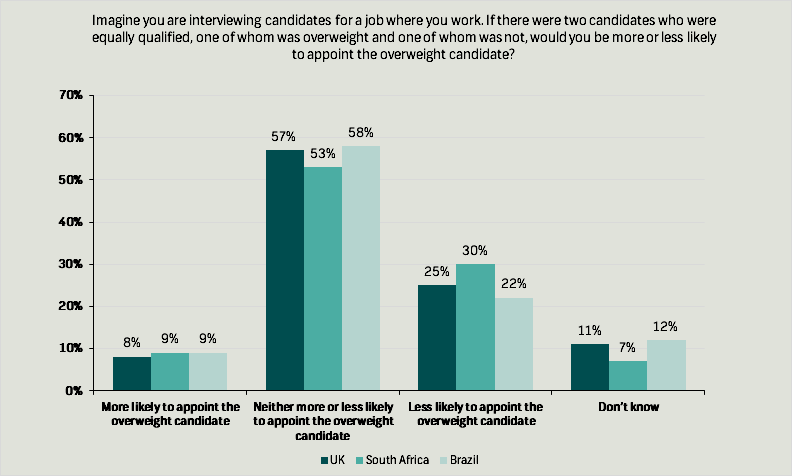 The majority in each country said they would be neither more or less likely to appoint the overweight candidate -57% in the UK, 53% in South Africa and 58% in Brazil. 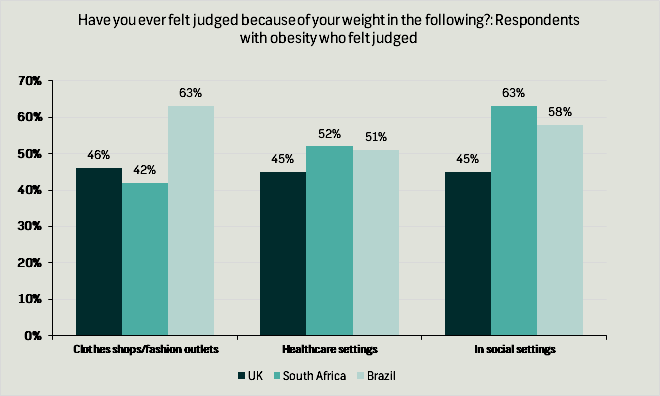 Similar to the above findings, 46% of respondents with obesity in both Brazil and South Africa have felt judged because of their weight at their work. To learn more about Survation’s international polling capabilities contact Harry Mason or John Gibb on 020 38189661 or email researchteam@survation.com. Survation surveyed 1115 adults aged 18+ in UK online. Fieldwork was between 18th-24th September 2018. Data tables and methodology are available here. Survation surveyed 1125 adults aged 18+ in South Africa online. Fieldwork was between 18th September – 1st October 2018. Data tables and methodology are available here. Survation surveyed 1105 adults 18+ in Brazil all online. Fieldwork was between 20th-22nd September 2018. Data tables and methodology are available here.